If you’re a recreational player looking to improve your game—but don’t have the time to invest in a total overhaul—then The Basics training program is perfect for you. We’ll reinforce the proper fundamentals of your golf game and provide you with a sound understanding of basic mechanical concepts. Develop more club-head speed and ball speed with Hitting It Farther. Our unique baseline-testing process evaluates all the factors associated with generating speed. 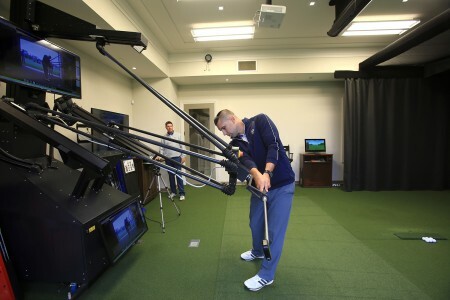 This includes physical capacity, golf-specific mobility, equipment profiling, kinematic sequence and technical efficiency, as well as time on the innovative Robotic Swing Trainer. Our Putting Master training program features a concise and effective review of your putting and green-reading skills. You’ll also receive a custom putter fitting at the innovative Science and Motion PuttLab—the ultimate putting tool that uses ultrasound measurements and displays the results in easy-to-understand reports. Become a more efficient scorer around the greens with Wedge Guru. This unique baseline-testing training program is designed to evaluate your short-game efficiency. Test results will then be used to determine a practice strategy and a focus on the athletic and technical skills that require the most attention. 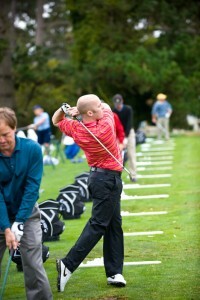 Please contact Pebble Beach Golf Academy at (831) 622-8650 to discuss a custom training program designed just for you. Turning three putts into two or one can do wonders for your handicap. The Putting module covers putting stroke fundamentals and individual stroke analysis, green reading techniques and general putting drills, as well as distance and feel drills. Another vital path to better scores for you, the short game includes instructional advice and practice techniques for chipping from slopes, bad lies and fairway shots, as well as the flop shot. In the sand, we’ll cover fairway and greenside shots from normal and buried lies. Moving out to 60 yards, we’ll work on pitch shots and the bump and run, and discuss the pros and cons of each. Everyone loves to air it out, whether from the tee or from the fairway of a long par-five. However, accuracy counts in this game and many golfers are forced to make a trade-off. To get the most out of your long game, instructors will teach you alignment and posture and provide an individual analysis. We’ll also cover the individual clubs and shots of the long game, from driver and fairway woods to long, mid and short irons. How much concentration is too much? How loose should I be before I hit the first tee? What foods should I eat and what exercises can I do to keep in top physical shape for my golf game? What are the best exercises for warming up prior to play and practice? These are just some of the questions we’ll answer in the mental/physical section of the Academy. On-course applications of your swing and course management principles take your session from the theoretical to the practical. Don’t be surprised if your pro pays a visit or even plays a round with you. This is where it all comes together!